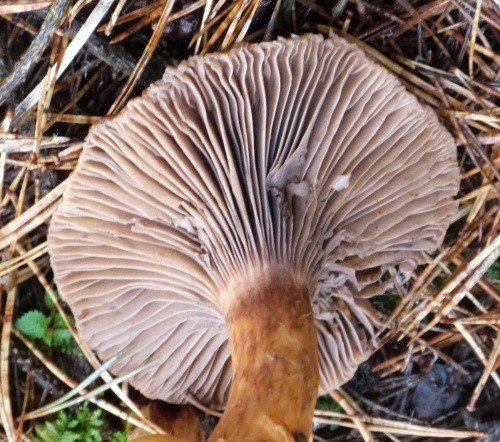 The coppery caps of Chroogomphus rutilus may be 15 cm across and take on a metallic sheen on sunny days. Occasional specimens flatten fully, sometimes with a sharp umbo, but more often the caps remain convex when mature. The pale cap flesh is vinaceous (tinted like red wine). 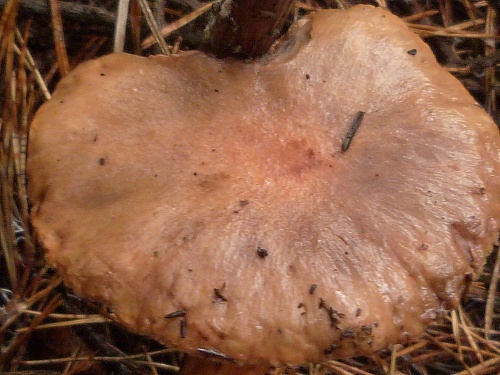 In wet weather the caps of this species are viscid, drying with a smooth shiny surface. The close, thick gills are initially grey-white or dull olive-buff, but they soon take on a dirty purple hue. They are deeply decurrent. Has a strong association with pine trees which limits the habitat to pine litter. Recorded only occasionally as we have few pinewoods in our two counties.